Yesterday, I chatted with Steven Nester of PRX's Poets of the Tabloid Murder. That interview is now streaming for your listening pleasure. "Hendricks is very good at his job... Holm (The Collector Trilogy) is good at his job, too. His prose is lean, his pacing brisk, the suspense high and his plot unpredictable... There's plenty of violence and dark humor, but heart as well, with Hendricks holding a candle for a love he can't forget. He's not just the killing kind; he's also the romantic kind." Last week, I sat down with Caroline Cornish to talk about THE KILLING KIND. The interview aired during Friday's episode of 207. If you'd like to check it out, it's up in its entirety here. By my count, I only have eleven minutes and twenty seconds of fame left; I'd better use them wisely. Another morning, another quick link update. 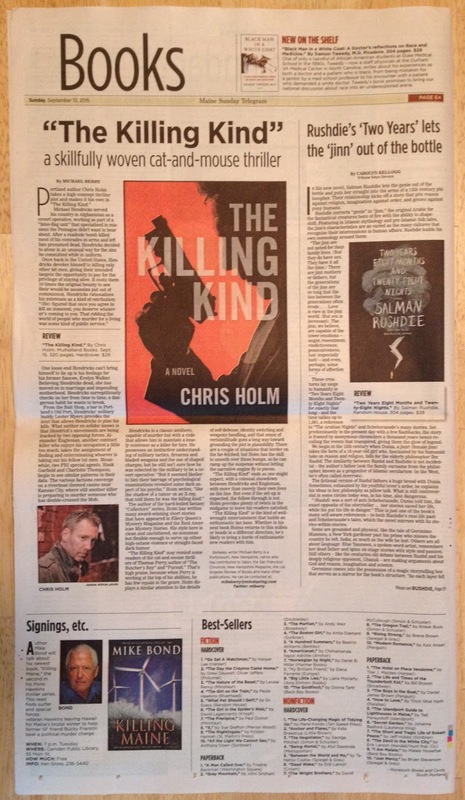 THE KILLING KIND got a nice mention in the Toronto Star alongside the latest from Lee Child, Hakan Ostlundh, and my pal John McFetridge. They called the book "freewheeling" and "inventive and specific in its ferocity." I'll take it. The UK crime-fic site Crime Review took a peek at THE KILLING KIND, too, declaring it "a fast, hard-edged thriller that doesn’t pull its punches." And finally, I took part in the #30Authors blog event this year, in which thirty authors each write a guest-post on a book blog recommending a novel. I chose Stuart Neville's excellent THOSE WE LEFT BEHIND. Today, at Fourth Street Review, that post went live. Many thanks, Rory, for lending me the blog space! Today, I'm at the Los Angeles Review of Books, chatting with Angel Luis Colón about violence, redemption, and happy accidents. "You may not be familiar with Chris Holm, but you will be soon. Holm is the author of a somewhat off-the-radar semi-supernatural trilogy known as the Collector series and has garnered a great deal of acclaim... His new novel, THE KILLING KIND, takes him in a somewhat different direction. It’s a crime thriller with a surprisingly sympathetic protagonist and a startlingly original premise that moves along so smoothly and quickly that you almost forget you’re reading." And in other other news, if you live in Maine, watch 207 tonight (WCSH, 7PM) to catch my televisual debut! I chat with the lovely and talented Caroline Cornish about THE KILLING KIND. Will I faint? Throw up? Both? Tune in to find out! Today, Steve Weddle was kind enough to have me by Do Some Damage to answer some questions about THE KILLING KIND. You can read our conversation here. Steve, as some of you may know, was instrumental in the genesis of THE KILLING KIND. Who knows if it would've been written without his prodding? "The violence in THE KILLING KIND is visceral, the writing is tight and tense, and the characterizations are more in-depth than usual for this genre. This is a fun spin on crime fiction by having a hero who may also be the villain. The unpredictability of the story will also have readers wondering what's going to happen next, if this is indeed the first in a series." I'm over at Maine Crime Writers today, talking manhunts and gratitude. Click through to give it a read. Just a couple quick items today, and then it's back to the writing mines. Item the First: I subject THE KILLING KIND to the Page 69 Test. Don't know what that is? Here's a handy explanation. Item the Second: At Writers Read, I talk about three books I've enjoyed recently. Julia Spencer-Fleming, Michael Koryta, and Don Winslow make appearances. If you're looking for a great read, you'd do well to check 'em out. "The action makes you feel like you are in the middle of a John Woo film and the characters bring more surprises and emotion to the table than you may be prepared for." "What makes the book sing is not some shotgun marriage of genres—this is a thriller, plain and simple—but its lean action, breakneck execution, and a nervy concept that's almost too perfect: Protagonist Michael Hendricks is a hit man who only hits other hit men... THE KILLING KIND is a brutal book about brutal people in a brutal world... For all its violence and darkness, though, the book has plenty of sly humor, sharp dialogue, and even the occasional yanked heartstring... relentless and breathtaking." And as an added bonus, Jason snuck in some praise for my Collector trilogy, calling it "...a grim, imaginative take on the detective yarn." Not too shabby, that. THE KILLING KIND is Now Available! As of today, THE KILLING KIND is officially out in the US, wherever books are sold. I've waited a long time to type those words. Now that the day is finally here, I couldn't be happier. It's only mid-morning as of this writing, but my release day's already been pretty nuts. THE KILLING KIND was, briefly, a trending topic on Twitter. Reviews, interviews, and well-wishes are coming fast and furious. I'm sure I'll fail to thank someone along the way, but not for lack of trying. "Whether it’s cringing at the depths of Engelmann’s depravity, or picking up the most subtle of character beats of the vast supporting cast that make up THE KILLING KIND, the reader can’t help but be fully invested in what befalls the players in this thriller. Holm has put fully formed people on the page… and then proceeds to do horrible things to them. Because that is what exceptional authors do." The Life Sentence is chock full of content related to THE KILLING KIND, including an interview (with my lovely and talented wife, who also happens to be an editor for the site WAIT IS THAT WHY THEY'RE BEING SO NICE TO ME?! ), a review, and an amazing Tumblr post. "Previously known to readers for his outstanding, intricately plotted and laced with dark humor urban fantasy meets noir Collector trilogy, Holm has both shifted gears somewhat and at the same time upped his game with THE KILLING KIND. While the Collector books were universally praised, appearing on scores of 'Best of the Year' lists, THE KILLING KIND’s more mainstream thriller setup has the potential to open new doors for Holm and expand his reader base exponentially. And this would be a good thing for everyone, because if there’s one thing readers could use more of, it’s Chris Holm penned stories." Many thanks to Dan and the whole Crimespree crew; Katrina, Jordan, Lisa, and Adam at The Life Sentence; Elizabeth; and everyone who's blogged, shared, reviewed, retweeted, or bought the book. And extra-special thanks to these fine folks, without whom I wouldn't be where I am today. The official release date of THE KILLING KIND is just hours away, and I'm happy to bring news of two new reviews! John Valeri of the Hartford Books Examiner took a peek at THE KILLING KIND—as well as Michael Koryta's LAST WORDS (which, I can attest, is a spectacular read) and James Patterson's 14TH DEADLY SIN—and declared it "an intelligent and droll shot of adrenaline that aims high and more than makes the mark." Rob Taub at Huffington Post gave THE KILLING KIND a gander, too, and had this to say: "Holm takes a one note premise and pulls the reader in with beautiful narrative and excellent pacing... If a movie deal hasn't been made, I'm sure there's one in the works." Today, I woke up to a text from my mother that read, "Put a Sunday paper on your front stoop." I was pretty sure it was a declaration, not an instruction, so I looked outside... and found out that not only did THE KILLING KIND get a rave in today's Maine Sunday Telegram, said rave took up three-quarters of their Books page! Here's a link to the digital version, so you don't ruin your eyeballs trying to read that photo. Many thanks to Mike Berry, who wrote the review, and my mom, who enthusiastically delivered it by dark of night. Two posts in one day? Insanity! But news is coming fast and furious now that release day's nearly upon us. Here's the latest: The Strand Magazine included THE KILLING KIND in its roundup of September Reads. So what'd they think? "An adrenaline-packed read from start to finish, this first installment in what we hope is a new series is a must for thriller fans." I'm elated that they enjoyed it—and honored to be featured alongside the likes of Catriona McPherson, Stuart Neville, Karin Slaughter, and Sarah Weinman. My Nefarious Internet Promotion Machine (TM) is kicking into high gear as THE KILLING KIND's release nears, so prepare to see a whole lot more of yours truly in your feed for the next few weeks. Today, I'm at Crime Files, talking Clue, The Humpty Dance, and presumably also about my new book a little bit. A heads-up for my American readers: Crime Files is a UK site, and those wily imperialists insisted upon colonizing my words with superfluous U's. Also, they spell "Clue" wrong. YES, I KNOW THE LANGUAGE IS NAMED AFTER THEM. You'll also find me at the lovely and talented Elizabeth A. White's blog, talking about my grandfather, who instilled in me my love of crime fiction. Elizabeth, as near as I can tell, has quite sensible views on the usage and placement of U's. "What makes this book stand out to me? Though my expectations were met, nay exceeded, I still felt a loss when I turned the final pages. The ending was so tremendous and so unexpected that I’m aching for more." Yesterday, I received a copy of the final US version of THE KILLING KIND. It's my first hardcover release, and it's as gorgeous as I've come to expect from Mulholland Books—sleek, modern, and eye-catching. There is, however, something missing. Namely, my acknowledgments. A few years ago, Steve Weddle, editor of Needle: A Magazine of Noir, asked if I’d be interested in contributing a short story. I pitched him a couple ideas, and he pushed me to write the more ambitious of the two. The resulting story, “The Hitter,” was nominated for an Anthony Award, appeared in THE BEST AMERICAN MYSTERY STORIES 2011, and served as the basis for THE KILLING KIND. I think that means I owe Steve a drink. Otto Penzler and Harlan Coben, editors of THE BEST AMERICAN MYSTERY STORIES 2011, deserve my thanks, too. Their faith in “The Hitter” played no small part in my decision to write THE KILLING KIND. Shepherding Hendricks from short story to novel wasn’t easy—that guy’s not one for taking orders—but thankfully, I had some help along the way. THE KILLING KIND would be a pale shadow of itself without the guidance and wisdom of my agent, David Gernert, and my editor, Josh Kendall. Their fingerprints are all over its strongest moments, and I’m a better writer for knowing them. David’s team at The Gernert Company has been a dream to work with—Ellen Goodson and Anna Worrall in particular. The same goes for the fine folks at Mulholland/Little, Brown—most notably Pamela Brown and Sabrina Callahan. And Ruth Tross of Mulholland UK has proven a delight as well. I’m extremely grateful to Megan Abbott, David Baldacci, Chelsea Cain, Hilary Davidson, Joseph Finder, Simon Kernick, Owen Laukkanen, Stuart Neville, and Marcus Sakey for their early support of this novel—and to the crime fiction community at large for embracing me as their own and championing my work for years. It’s a hell of a thing to realize you’ve found your tribe. I’d be remiss if I didn’t thank my family—Burns, Holm, and Niidas—for their unflagging support; rarely has a loved one’s life of crime been so readily embraced. And finally, my deepest gratitude to my wife, Katrina, who helped set me on my true path and continues to light the way. Humbling though it is for this writer to admit, words fail to express how much that means to me. "THE KILLING KIND is a fast-paced, adrenaline-fueled novel marking a turning point in the career of Chris Holm. Where he was once a cult author with a loyal fan base, this new novel will no doubt make him a recognizable and leading name in the thriller genre moving forward." Many thanks, Kristopher! So glad you enjoyed it.